A while back, I came across this dining room photo on a longtime favorite blog, Coco + Kelley, and still open it up from time to time just for a smile. Dining areas are one of my favorite spaces to admire, (although I must admit, my dining room table is strictly used as a desk at the moment), there are just so many amazing options for decor! Besides having clean modern furnishings and a stunning chandelier, this dining room has a... wait for it...a giraffe! Talk about an interesting dinner guest. Could you imagine sitting down for dinner with this guy peaking over your shoulder at your plate?! On a sort of semi related topic, have you ever visited the website ZooBorns? It is one of my favorite instant mood boosters and has some of the cutest pictures of baby giraffes around. If you have the urge to procrastinate today, I highly recommend you give it a go:). *Note: I think, and hope, Mr. Giraffe here is made of plastic or something. My past thoughts on taxidermy here . I love this space! I feel like my dining room is so blah - so maybe a giant giraffe would perk it up?! Love your blog - happy I found it! Giraffes really are so chic, no? I mean, those eyelashes! And baby giraffes--the cutest! I would love to dine with one..as long as it wasn't taxidermal (gross!!). OMG! This looks strange and elegant. 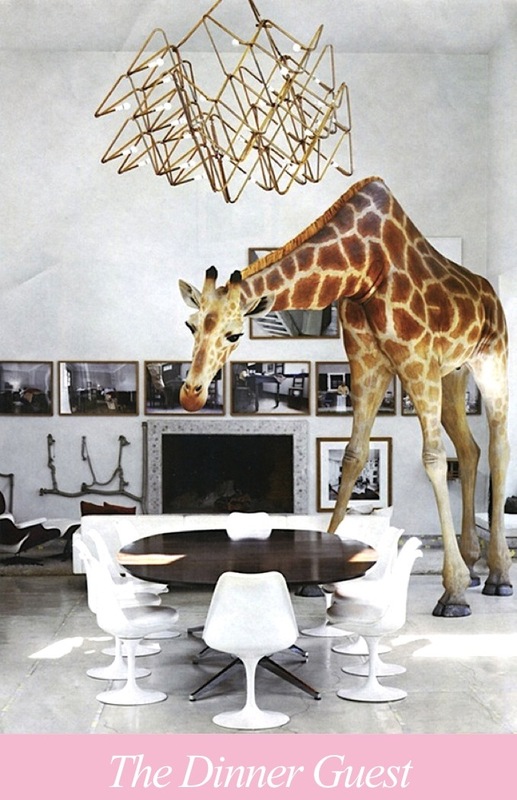 I can't imagine how you feel sitting on this dinning table with the giraffe over your head.